On March 22, students from Webster University Thailand and Stamford International University joined hands as part of a voluntary effort to clean up Hua Hin’s Central Beach. Organized by the respective Rotaract Clubs of the two universities, the afternoon provided an opportunity to highlight the environmental damage caused by littering. A public art project for students, faculty and staff to express messages of solidarity in the face of a hate incident on campus titled “We Are All Webster” began on Dec. 5. 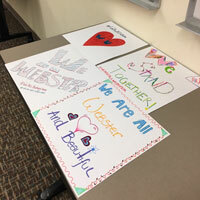 The pieces will be displayed around the home campus as a celebration and statement that all are welcome at Webster. Submissions will still be accepted at the Office of Student Engagement, West Hall Housing Office, Office of First Year Experience Programs and the Multicultural Center and International Student Affairs department.